• Thank you for the wonderful workshop and a lovely and creative day. The techniques I learned will be fun to use. Lunch was delicious! Thanks to you and your assistant (cheers to hubby) for your hospitality. Those soups were great. I’ll be watching your newsletters and thinking about a workshop sometime again in the near future. 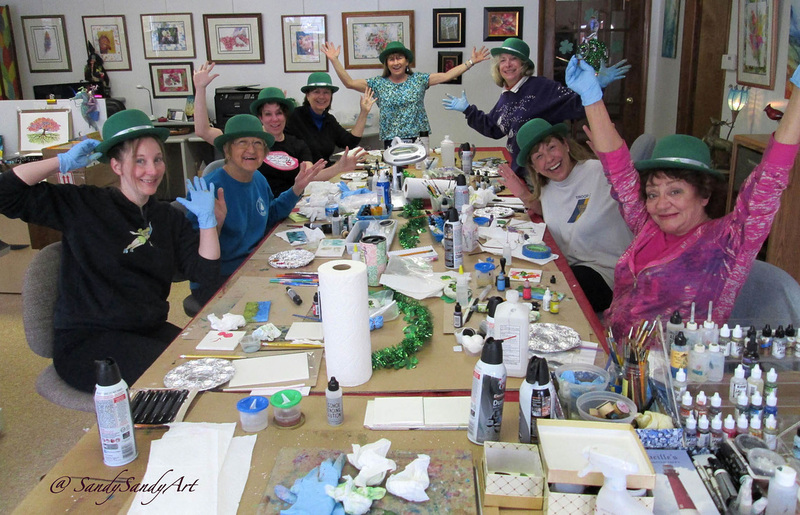 • I feel I learn so much at each class and am getting more comfortable using the alcohol inks. There is still so much to learn. I am amazed at your beautiful work and the fact that you have been using the inks for a relatively short time. You are a very patient and experienced teacher. Thank you so much for a really great day. • Thanks, again, for a fabulous workshop, terrific lunch and the beautiful flowers. I am very inspired and am going to start practicing tomorrow. See you in September. • Please let me know when the next workshop is because I know it's going to fill up fast... Like the last one. I learned soooo much. You're a great teacher, Sandy! • Thanks for a wonderful learning day. I have been looking at things differently, trying to apply some of the things you suggested. I now realize why someone will travel great distances to your classes. You give so much, not only in lessons but you freely share your knowledge of art. It takes away that fear. • I feel so lucky! I can't tell you how much fun I had at your home. You are a very precious person and I immediately felt the comfort and love that you portray. I am so happy that I have met you! 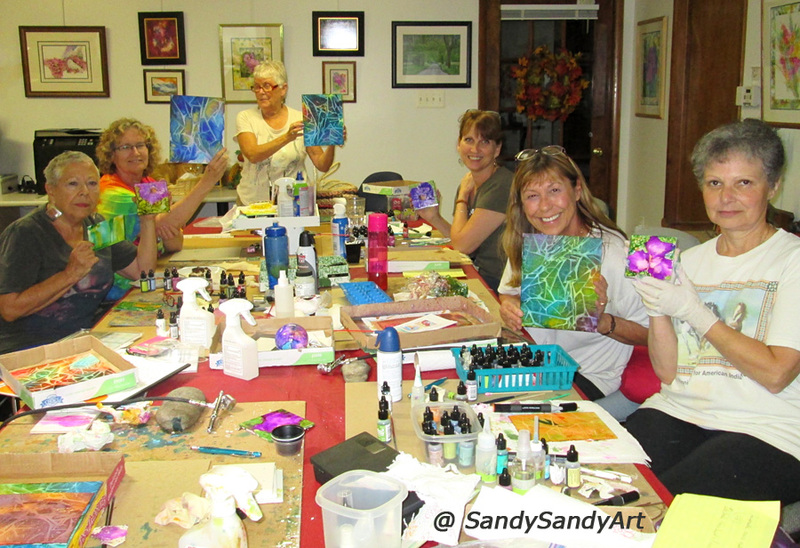 See more details and photos from Sandy's workshops here. for the Arts for 5 hours. share with them! IT'S AN ARTISTIC ADVENTURE! • Looking forward to the upcoming workshops. You are a fantastic teacher and sooo inspiring! Thank you Sandy for such a wonderful day. whenever you have the opportunity. • Thanks for a great day with such Creative people. You are a great teacher, you make learning fun.